Auburn – Falls are the leading cause of fatal and non-fatal injuries for older Americans, according to the National Council on Aging. To help our community reduce fall risk, Sutter Auburn Faith Rehabilitation Department is now offering a Fall Prevention Tai Chi class. 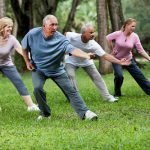 Tai Chi is a form of martial arts that involves slow, controlled and low-impact movements that can be easy for all ages—especially seniors. Tai Chi is practiced for multiple health benefits including reducing stress, lowering blood pressure and reducing inflammation. For seniors, tai chi can help prevent falls, improve hand-eye coordination, strengthen muscles and improve flexibility. Christopher Lovelace, a physical therapist and certified tai chi instructor at Sutter Auburn Faith Hospital, says a tai chi class can help increase balance and strength and instills confidence in mobility. The hospital will begin hosting their fall prevention tai chi classes for seniors on Oct. 30. The classes will meet twice a week (Monday and Friday from 10 – 11 a.m.) for eight weeks. The cost for 16 classes is $50. To register or for more information, contact the Sutter Auburn Faith Rehabilitation Department at 530-889-6088.